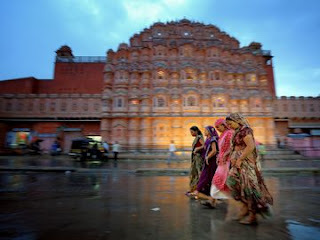 I thought this would be a good place for pictures, so I returned during the evening on my second night in Jaipur. I got lucky with the rain because it made for interesting reflections, and I had a good time trying to capture the chaotic motion on the streets of Jaipur. Hawa Mahal (The Palace of Winds) is pictured in the background.